Is Your Bird Safe Outside Its Macaw Cage, Parakeet Cage, Cockatiel Cage, etc. 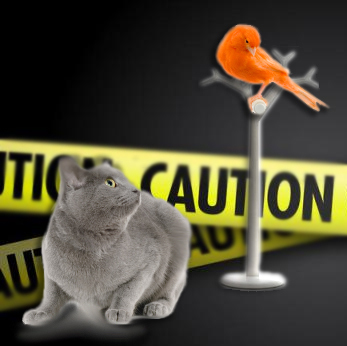 Part one of this article discussed how specific rooms around the house pose many dangers for companion birds of all sizes. Part Two covers house wide dangers, many of which are often missed even by the most careful of bird owners. Birds spending time outside of their cages (macaw cages, for example) can be subject to poor air quality as well as many toxic household plants. Cages like a macaw's cage protects birds from many of these hazards, but owners must still shape their environments to welcome their birds during time outside of the bird cage. Time outside of the cage for macaws, parakeets, African greys and other breeds are crucial to avian health, so owners should be attentive to additional environmental elements, such as air quality, toxins and interactions with other children and pets. Check beds before adding multiple layers of fabric to make sure your bird hasn't gotten trapped between linens. Check laundry baskets before throwing any clothes into a washer or dryer. Use caution with fold-out beds or recliners. Avoid sleeping with your bird. Socialization Hazards Outside of the Macaw Cage, African Grey Cage, etc. Interactions with Pets- Birds can peacefully coexist with other animals as long as owners plan ahead and prepare for their interactions. Cats and dogs, for example, are hunters by nature, and the quick movements of a bird outside of its macaw cage can attract the curiosity of these larger animals. Wounds from other animals can be lethal to birds, thus owners must be cautious when allowing birds outside of their macaw cages. Cats can climb, jump, and cling to places their owners might not expect; therefore, the macaw cage location must be out of the reach of these animals. A bird with clipped wings can be helpless outside of its macaw cage in the presence of some pets. Below are some additional guidelines for bird owners who also have other pets. Never leave a bird in a room alone with another pet, regardless of how well they seem to get along together. Place the macaw cage in a location where pets cannot climb onto it or push it over. Cover all aquariums to reduce any drowning risk. Deny birds access to cage materials for other pets such as hay bedding or litter boxes to prevent respiratory or digestive problems. Deny birds access to heat lamps for reptiles to prevent burns. Interactions with Children-Children can pose dangers to birds, and birds can cause injuries to children. Children can harm birds if they mishandle them or are uneducated about them. Supervision is key to teaching and encouraging appropriate socialization between children and birds both inside and outside of the macaw cage. Educate children about what startles birds and what they are and are not allowed to feed them. Teach them to avoid poking their fingers through the macaw cage bars or taunt/tease the bird. Use proper judgment when determining the best time to allow children to interact with a bird outside of its macaw cage. Take into account both the bird and the child's temperament. Establish rules about the handling of the bird including when/how to feed it, who cleans the macaw cage, who takes the bird outside of the macaw cage, etc. Always have a safe place where birds can retreat if they are scared or hurt. The exhausting amount of household hazards for birds can overwhelm some new owners. It can help to look at each room separately to identify many of these hazards and avoid allowing the bird outside of the macaw cage until each room is ready. After bird-proofing one room at a time, an owner can open the macaw cage, but restrict access to only the safe room(s). The task may be daunting, but it is nevertheless necessary for all bird owners. The BIG 3 Bird Feeding Links! Knowing a companion bird is safe in its environment both inside and outside of the macaw cage can be a freeing and relaxing experience for both bird and owner. Bird-cage.com offers a wide selection of playtop cages that promote avian health by providing safe and constructive ways for parrots to spend time outside of the bird cage.